Understand themselves immediately: On the fifth floor of Adam Opel Haus three production colleagues meet Jürgen Klopp. 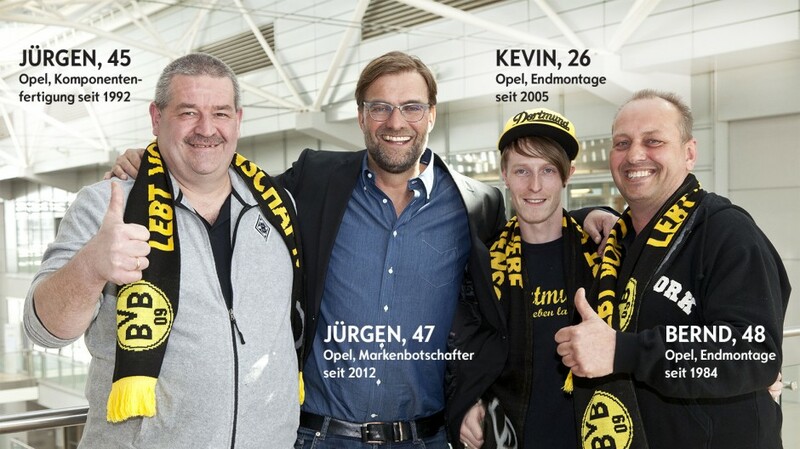 Success fanatic, friend, motivator and Opel brand ambassador: Jürgen Klopp has many faces. Three production employees interviewed the coach of Bundesliga outfit Borussia Dortmund for the Opel Post. Football, cars and other passions all play a part. Verstehen sich auf Anhieb: Im fünften Stock des Adam Opel Hauses treffen Jürgen Klopp und drei Kollegen aus der Fertigung aufeinander. 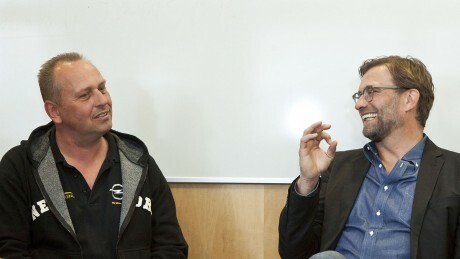 A laugh like no other: Jürgen Klopp feels very much at home at Opel’s headquarters. Let’s wait and see what his face looks like after his team’s next Bundesliga match against FC Bayern München. Kevin Elliot has every reason to look forward to the interview. The 26-year-old is Dortmund born and bred, a Borussia Dortmund supporter and he works for Opel in final assembly. He is one of three employees who will get the chance to interview Jürgen Klopp as part of the Opel Post initiative “Colleagues meet”. Elliot’s teammates are Bernd Wadin, also from final assembly, and Jürgen Mumbächer from component production. Last Friday at 10.50 in the morning. Elliott, Wadin and Mumbächer line up in front of the Board Room where normally the Opel leadership team meets. Suddenly the elevator door opens and out steps Jürgen Klopp. White sneakers, jeans, blue shirt, black jacket and a huge smile. “Hi lads,” he calls. “All good?” Yes, everything is fine. 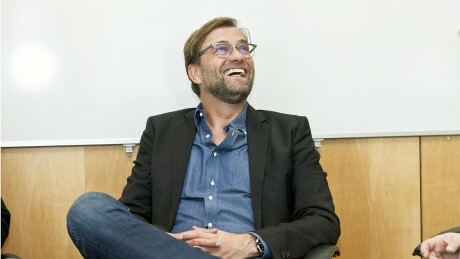 Statements für die dealers of the brand: Klopp during a video shooting. First impression: “He look taller than I expected from up close. He is over 1.90 meters,“ said Wadin. Klopp walks into the Board Room and find a hive of activity. People are adjusting a camera and the light. A make-up artist grabs Klopp to sort out the hair and powder his face. Before the Opel Post can get a piece of Klopp it is Andreas Marx’ turn. The Marketing Director for Opel Germany is grilling Jürgen Klopp for a video about leading a team, a winning mentality – statement for the dealers of the brand. A few minutes later, the Opel Post is up. The trio quickly grabs chairs and gets into position. Klopp joins the group. The formalities are sorted out quickly. “What shall we call you,“ asks Elliot. “Call me Jürgen,“ says Klopp “and you are…?” Which is followed by a short introduction. After choosing a Borussia Mönchengladbach sweater Mumbächer is treated to the famous Klopp snarl – obviously with a wink and then the interview starts. Sport, passions and Opel’s vehicles are all covered. 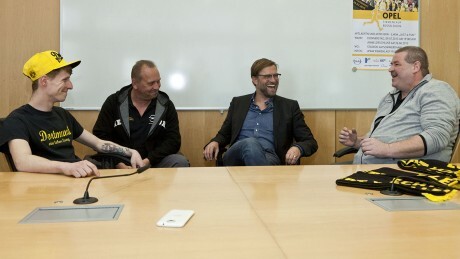 Klopp talks to the Opel Post with Kevin Elliott, Bernd Wadin und Jürgen Mumbächer (from left to right). Bernd Wadin: Jürgen, my colleagues and I assembled your Insignia OPC on the production line. How happy are you with the car? Or to put it differently: Is there anything you would criticize? Jürgen Klopp: Shall I tell you what really got on nerves especially at the start? Having to drive around Dortmund, the city with the most speed cameras in the world, at least that is my impression, with this 325 hp powerhouse. Honestly, the Insignia OPC reminds me of the perfect football player – fast and technically skilled. Tell the boys on the line that it is a great car. It looks great and is great to drive. By the way, I have it in the coolest color of the all: matt black. Kevin Elliott: What other Opel would you be interested in apart from the Insignia OPC? Klopp: I want to get myself an ADAM ROCKS. Simply because it is a funny and good-looking car. And it is convenient too. I drive a lot of short distances – to the training sessions for example – when I am alone in the car. I love the off-road appearance and when you open the roof, you pleasant open air feeling. Jürgen Mumbächer: You drove the Mokka around the test track in Dudenhofen for the advertising campaign. How did you like the steep banking corners? Klopp: It was great. It is an experience I would recommend to anyone. I went hammering through there seven or eight times. I was a completely new experience because the car is almost on its side. No idea whether it was the excitement or the heat on the day but I had to take my shirt off and dry it out in every break. Mumbächer: Let’s talk football now. The first half of the season did not go as planned for Dortmund and you were last. You were recently knocked out of the Champions League. But Borussia have bounced back in the Bundesliga and you have reached the last 8 in the German cup. Can you still lead Dortmund to a place in Europe? Klopp: Puuh! I really don’t know if we will manage that. It will be tough. Just let me point out that we did not deserve to reach the next round of the Champions League this year. Klopp: Our performances just weren’t stabile enough in the Champions League. We have found our stability in the Bundesliga again. Obviously, the team has a heavy burden to carry after a disappointed first half of the season. When we take the lead, we do not immediately think about getting a second goal. Instead we have to concentrate on not conceding an equalizer. But we are improving. Bayern Munich will be coming to Dortmund next and we always have a chance against them. And not only when Robben and Ribéry are out injured and Neuer is making mistakes like he did against Mönchengladbach. Wouldn’t you agree Mr. Mumbächer (smiles at the Gladbach supporter). Wadin: I am a FSV Mainz 05 supporter and have very fond memories of when you were our coach. Why did you leave? Klopp: We were playing in the second division with Mainz in the 2007/2008 season and I had been there as a coach for seven years. I had the feeling that I could really create something special if we managed to win promotion but that if we failed it would be time to go. Well, we missed out on promotion. Thousands of people lined the streets when I bid farewell to Mainz. Unbelievable. „Through Dortmund with 325 hp“: Jürgen Klopp tells Bernd Wadin about his experiences with the Insignia OPC. Wadin help make Klopps car. Wadin: And why did you choose Dortmund? Klopp: Because it offered the best package. The tradition, the spirit, the stadium, the tremor from the south stand is a atmospheric melting pot – brilliant. That is why the claim “True love” really does reflect what we are as a club. The fans showed their true love no matter how dark the times were and always stuck with us. They don’t just come when we are on a roll. I think that Opel employees can understand what I am trying to say. Mumbächer: Would you be interested in managing the German national team instead of a club team? Elliott: Well, until that happens you will have to continue to recover from the stress in Dortmund. Where in the city can you do that? Klopp: I do not really go out much and, as you can imagine, people do tend to recognize me in Dortmund. I rarely go to cafes cinemas of restaurants. To be honest, I have only been to the city center about ten times in the last seven years. I do enjoy getting out into the open. I know it is hard to believe but Dortmund is a very green city. I can go for long walks with our dog Emma and relax. Wadin: Last question: You have been an Opel brand ambassador for almost three years now. Is there one special Opel moment? Klopp: That is an easy way. My appearance at the works meeting earlier today. I love doing the media appointments, the TV ads because I enjoy being part of the Opel brand and I believe in the products. But I had never been to a production building before. Standing there in front of the people responsible for making all the products gave me goose pimples. And I am convinced that the future will be a lot of fun with this team. When the final words have been spoken and the recording device switched off, all of the other colleagues who followed the interview descend on Klopp. Selfie alarm. But the star keeps his cool even when a fan with an iPad approaches him and asks him to say a few word for a wedding. While Klopp is trying to make everyone happy, Kevin Elliot, the Dortmund-born Borussia fan from final assembly, is once again playing with his cap. “A great experience. And I have the feeling that I need to watch a match live in the stadium again soon,” he says. Exciting, approachable, German: These are the Opel brand values but they also describe Jürgen Klopp. Therefore, it is no surprise that the cooperation between the carmaker and the coach can look back on three authentic, eye-catching and successful years. Coaching career: Opel brand ambassador Klopp kicked off his coaching career in 2001. The Stuttgart-born coach took over the reins at FSV Mainz 05 when they were in the relegation zone of the 2. Bundesliga as caretaker coach. Klopp, born in 1967, led them to safety. He later went on to lead them into the 2005/2006 UEFA Cup – the biggest success in the history of the club. 2008: Klopp decides to join Borussia Dortmund. He celebrates two championships (2011 and 2012) and reaches the final of the UEFA Champions League (2013) where Dortmund suffer defeat at the hands of FC Bayern Munich. Dortmund are currently tenth in the Bundesliga after a slow start that saw them sitting in last place. Private life: Klopp and his wife Ulla live in Herdecke just a few kilometers south of Dortmund. “I am no hero when it comes to cleaning up the house but I am a carrier – I carry things from one place to another,” he explains. Media favorite: His knowledge and wit make Klopp extremely popular as a TV pundit. He won the German TV Award for his performances during the 2006 and 2010 FIFA World Cups.